Poe has vowed to annihilate the river raiders who robbed her of everything two years ago. But as she navigates the treacherous waters of the Serpentin Who do you become when you have nothing left to lose? To ask other readers questions about The Last Voyage of Poe Blythe, please sign up. Does anyone know if this is a standalone or going to be a series?? Most of this book takes This review can also be found at Carole's Random Life in Books. This is such a unique dystopian in that it feels like a pirate theme mixed with western vibes. This follows Poe on her journey for revenge against the Raiders after they kill her boyfriend. She creates a weapon out of the ships meant to mine gold for their colony in the walls. When the Admiral gives her a ship to captain, Poe isn't sure what his end game is, and finds herself in a whole new position she isn't sure how to navigate. Poe goes in fairly cold-hearted and paranoid, and for good reason This is such a unique dystopian in that it feels like a pirate theme mixed with western vibes. This follows Poe on her journey for revenge against the Raiders after they kill her boyfriend. She creates a weapon out of the ships meant to mine gold for their colony in the walls. When the Admiral gives her a ship to captain, Poe isn't sure what his end game is, and finds herself in a whole new position she isn't sure how to navigate. Poe goes in fairly cold-hearted and paranoid, and for good reason when a traitor has made themselves known in her crew. From there, this is action packed and fast paced, with events happening back to back. This was a quick read because of how fast paced it is and the never ending twists throughout the plot. I liked seeing the world outside of Poe's compound but also liked the back story we get with her town. I wish there had been more information about how the world ended up in the state that it was, but I guess that will forever be a mystery. There is mystery around every turn as well. We don't know what all the gold is for, we don't know why this crew was hand picked, we don't know who the traitor is (BOTH times), and we don't know the end game until it is time. I loved trying to guess the different twists and who was who, which was an unexpected part of the story. My biggest problem with this was that there was little character growth. We don't really get much from the side characters, and not enough to ever really connect to them or love them. We get glimpses into their personality, but never really making them a full-fleshed out character. Poe goes through nearly no development for being pushed into a world and rule she is unfamiliar with. Her paranoia never leaves and becomes annoying at times. She isn't very likable because she always feels distant and cold. Even at the end, it felt too convenient for her thoughts to sway so easily from one thing to the next when she had been so dead-set on one idea for most her life. This is definitely a plot-driven story, which may be why I didn't absolutely love it. It was a fun read though and I mostly enjoyed the pacing of it. The Last Voyage of Poe Blythe is one of those books that sneaks up on you. Its strong in a silent sort of way, stringing you along page after page until you realize, near the end, that the story is more powerful than you could have ever imagined it to be. It's a desperate story of survival and touching in its own sort of feral and savage way. It shows us that living is more than just waking the following day and going about our routines. The story focuses primarily on Poe Blythe, her story of rev The Last Voyage of Poe Blythe is one of those books that sneaks up on you. Its strong in a silent sort of way, stringing you along page after page until you realize, near the end, that the story is more powerful than you could have ever imagined it to be. It's a desperate story of survival and touching in its own sort of feral and savage way. It shows us that living is more than just waking the following day and going about our routines. The story focuses primarily on Poe Blythe, her story of revenge and seeking her own form of survival - through some of the most barbaric means. From the very first chapter, this book will pull at your heart strings. I felt such a fierce pull toward this story from just that first chapter, which does a superb job of setting the stage for the rest of the book. In addition to Poe's story, Condie has created a fascinating dystopian world that I would absolutely read more of. I loved every aspect we were given, from Poe's settlement, to the river mining to how those outside the settlement live. It is clear that Condie put her heart into every aspect of creating this story. Additionally, there is a huge mystery subplot - as Poe tries to discover who on her team can be trusted and who is seeking every opportunity to betray her trust. I did NOT see those plot twists coming and by the end I couldn't help but to think, "I wish this wasn't a standalone!" Seriously, I would read the next chapter in this story immediately. Thank you so much to Penguin Teen and Dutton books for an early copy of this book in exchange for my honest review. The Last Voyage of Poe Blythe was a surprising read for me. it follows Poe on her journey of revenge following the death of the person she loves. But the story is so much more than that. Poe is stricken with grief, which turns to anger. She uses that anger to build up her walls and build up the armor on the machines they use in the book to gather gold from the Serpentine river. But Thank you so much to Penguin Teen and Dutton books for an early copy of this book in exchange for my honest review. The Last Voyage of Poe Blythe was a surprising read for me. it follows Poe on her journey of revenge following the death of the person she loves. But the story is so much more than that. Poe is stricken with grief, which turns to anger. She uses that anger to build up her walls and build up the armor on the machines they use in the book to gather gold from the Serpentine river. But Poe's limits are tested when she's forced to accept help from people she would never trust. But that's because Poe doesn't trust anyone. It definitely made for an interesting story. The story flowed very well. I never felt confused from chapter to chapter, and honestly you'd be a bit surprised how often I noticed that in books that I read. I don't like stories that jump around a lot. There were a few flashbacks here and there but they were integrated into the story very well. Poe. Really. I adored her. I found her to be realistic. Her grief can be truly felt and the aftermath of what happened made the story and how she reacted feel even more authentic.I have read reviews where people felt like she suddenly changed and suddenly started to trust people, but I didn't really get that vibe from the story. It seemed like her character progression was seamless. If you're like me and you tend to like unlikeable characters I think this book is definitely for you. I truly felt like finding yourself was such a pivotal point to the book. The dredge was such a cool setting for the story. I think that the close quarters everyone was forced to live in really brought out the trust issues Poe had and it added to the story in such a vibrant way. It's dirty, it's grimy, and I loved it. While I felt like the story flowed well I found myself wondering again and again where we got to where we were. I wish there was a bit more back story on why the Outpost exists and why the Drifters fought against them. You get a bit more information towards the end, but I think this story would have benefited a bit from a clearer beginning. While I liked Poe I wish we would have had more backstory or development for the supporting characters. While the book isn't big (324 pages in my paperback copy) I craved more information on everyone. Which is especially sad considering I loved how close quarters the setting was. I found myself sometimes struggling to remember who was who, which often made me want to go back and re-read chapters and no one has time for that. Disclaimer: I received this ARC courtesy of a Bookish First giveaway. I am grateful for the opportunity to review an ARC for my readers, but this will not influence my final rating. All opinions expressed in this review are my own and based solely on the book. Buddy Read with the Magical Rendz from the always amazing Reading with Rendz! This book was....not what I wanted. I haven't had the best experiences with Condie's writing before, but this book sounded so interesting and not like anything tha Disclaimer: I received this ARC courtesy of a Bookish First giveaway. I am grateful for the opportunity to review an ARC for my readers, but this will not influence my final rating. All opinions expressed in this review are my own and based solely on the book. This book was....not what I wanted. I haven't had the best experiences with Condie's writing before, but this book sounded so interesting and not like anything that I had read before in YA, so I was reayd to give it a try. When Rendz and I first started talking about the buddy read, I really only remember two buzzwords - revenge and gold - and honestly that was enough for me. The buzzwords were pretty true. This book is about gold, revenge, and a ship. I think it also tries to take on colonization a bit, but I feel like everything kind of got lost besides the revenge and the ship and gold. Seriously, everything revolved around it, and not much was particular interesting. The story focuses on the last voyage that the people from The Outpost (a confusingly vague settlement that I still don't fully understand - but that's the entirety of the world). It does focus on Poe's emotional journey dealing with the death of her love, Cal, who was murdered by a group that lives outside The Outpost that constantly fights with Poe's peeps over who owns the gold. - Poe. I think Rendz said this best when we were reading: Poe was being Poe. And that's honestly all the ways I can describe her. She is definitely a special girl. She somehow has some vision that magically creates this super confusing armor (that took Rendz and I a really long time to create a picture but think porcupine ship and we good), captains her own ship/crew literally the SECOND time she even gets on a boat, and somehow knows exactly what to do? Her characterization was solely on her desire for revenge and love for her ship, which I thought was interesting, but it got real old real fast once there was literally nothing else. - The other characters. Rendz and I both agreed that the rest of the characters didn't have much personality. They were just very much there. Last year, I read Seafire by Natalie C. Parker that featured an all female crew on a pirate ship. There was a lot of them, but they were each dynamic, colorful, and distinct. This crew? I couldn't pick any of them out of a lineup, because they were stick figures in the background - eh, I think they actually might have been more hazy than that. They just existed and were names on the pages. There was also a lot of potential for a character that is the villain, and like IDK the villains were pointless. They just faded into the background, and then the big reveal/motivation at the end CAME OUT OF LITERAL NOWHERE. And it made no sense???? Speaking of which, that ending was so vauge, and just...it was weird and confusing and IDK. - The pacing. The first half was pretty slow, and it took a long way to warm up. Rendz and I both agreed that we enjoyed just how fast paced the second half went especially in regards to the shorter chapters and speed up of the action. It still lacked the tension and drama needed for it, but at least it went by so fast. So actually, this was an item that I did like - except I had to go through the slow part first. I wasn't that fond of Condie's Matched trilogy so I was pleasantly surprised by this book. I liked Poe and her character development as she struggles through grief and a need for revenge on the raiders who murdered Call- her growth made her a stronger character as she navigates her way without Call. Additionally, I liked her character flaws- she was paranoid, reckless and sometimes let her emotions dictate her decisions but she was relatable because the reality is that she's a lost 17-year-old gi I wasn't that fond of Condie's Matched trilogy so I was pleasantly surprised by this book. I liked Poe and her character development as she struggles through grief and a need for revenge on the raiders who murdered Call- her growth made her a stronger character as she navigates her way without Call. Additionally, I liked her character flaws- she was paranoid, reckless and sometimes let her emotions dictate her decisions but she was relatable because the reality is that she's a lost 17-year-old girl trying to way in the world which Condie does a great job portraying (although she was a bit wishy-washy about where her loyalty stood which I found to be kind of annoying and repetitious at times). The plot was good but it felt like it dragged on in some areas. The execution of the climax was well-written and was definitely a character-defining moment in Poe's character arc. The world building is there and felt very much like an extension of the Matched post-apocalyptical dystopian world. Matched fans will be pleased with the Matched references and Easter eggs sprinkled in. I also liked how the romance was there but as a subplot and didn't focus too much on it that it took away from the plot. Condie's writing was superb and the theme about finding yourself after a life-altering event/tragedy was dealt with perfectly (it felt like the book was just a giant metaphor really). The ending though... it's so open-ended and seems to be primed for the beginnings of a potential sequel. Thank you to Penguin Teen for an ARC of this book. In a future dystopian world, we follow Poe Blythe who after failing a ship mission for gold was able to save herself and her crew by coming up with the deadliest armor yet for the next ship. Now Poe sails for the first time since as first time captain of The Lily and she’s ready to avenge the death of her loved one Call. I found this book to be fine. The story was easy to understand and follow. I was interested in the bigger society group dynamics Thank you to Penguin Teen for an ARC of this book. I found this book to be fine. The story was easy to understand and follow. I was interested in the bigger society group dynamics. My faults lie with the details of such - there wasn’t enough politics substance for me here. I wanted to get into the nitty gritty of this dystopian world but it all felt pretty surface level. Similarly, the individual dynamics between our cast of characters - while reading i was excited and wanted to get to know more. But i was left with not enough to be satisfied. My full review will come soon as part of the blog tour. Poe Blythe has a familiar story: she fell in love, she went on what should have been an adventure, and the boy she loved was taken from her. Instead of running away (which would continue that familiar story) she becomes obsessed, driven entirely by a need for revenge. She has a brilliant mind but keeps her distance from other people, snatching power for herself when she's given the chance. When she's told that everything is not as it seems, she doesn't try to change sides, not really. She is her Poe Blythe has a familiar story: she fell in love, she went on what should have been an adventure, and the boy she loved was taken from her. Instead of running away (which would continue that familiar story) she becomes obsessed, driven entirely by a need for revenge. She has a brilliant mind but keeps her distance from other people, snatching power for herself when she's given the chance. When she's told that everything is not as it seems, she doesn't try to change sides, not really. She is her own side - and I think that's what I like best about her. Poe was the anchor that made this story work and served fabulously to keep me from lingering on what was missing. Overall, I thought this book was okay. It wasn’t great but it wasn’t bad. I like the story of it and the character progressions, but Poe’s obsession with revenge and Call was a bit unnerving. It was the biggest part of her personality and I wasn’t a fan of that. Besides her only motivations being revenge, her character change felt off. It wasn’t a sudden change, but it felt like there should have been more motivation for her to want to change her mind. Another thing I found odd was the ending. I Overall, I thought this book was okay. It wasn’t great but it wasn’t bad. I like the story of it and the character progressions, but Poe’s obsession with revenge and Call was a bit unnerving. It was the biggest part of her personality and I wasn’t a fan of that. Besides her only motivations being revenge, her character change felt off. It wasn’t a sudden change, but it felt like there should have been more motivation for her to want to change her mind. Another thing I found odd was the ending. It felt forced to me and I’m still trying to understand why they made this decision. Poe kinda gives an explanation as to what she is doing, but the other characters just seem to follow her around and do whatever she does. The last quarter was mildly action-packed, but overall this book just wasn't at all exciting. The plot didn't feel high-stakes so I was never really invested in the story. Poe was complex in that her feelings of grief/revenge made her kind of dark, but that's been done so many times in other books and has been done so much better by other authors that, to me, she wasn't an interesting or unique protagonist. Not to mention that her thought processes seemed to change out of nowhere and for no part The last quarter was mildly action-packed, but overall this book just wasn't at all exciting. The plot didn't feel high-stakes so I was never really invested in the story. Poe was complex in that her feelings of grief/revenge made her kind of dark, but that's been done so many times in other books and has been done so much better by other authors that, to me, she wasn't an interesting or unique protagonist. Not to mention that her thought processes seemed to change out of nowhere and for no particular reason. None of the other characters were at all fleshed out or complex: I hardly knew anything about anyone aside from their names. What would we bring on a revenge mission? Find out at our post! Buddy read with the amazing Mandy! The Last Voyage of Poe Blythe was definitely not an ordinary voyage across the river. It was fast paced and the action DID NOT STOP. I know that some really like Ally Condie, and some people do not prefer her books but guys don’t let this title or the author fool you! I felt like it was much different than the Matched Trilogy. The writing was definitely more compelling and it kept me wondering what was going to happen. I saw this new release coming and I was skeptical even though I enjoyed the M The Last Voyage of Poe Blythe was definitely not an ordinary voyage across the river. It was fast paced and the action DID NOT STOP. I know that some really like Ally Condie, and some people do not prefer her books but guys don’t let this title or the author fool you! I felt like it was much different than the Matched Trilogy. The writing was definitely more compelling and it kept me wondering what was going to happen. I saw this new release coming and I was skeptical even though I enjoyed the Matched books. The title threw me off because I thought the main character was a boy, but no Poe is short for Posey! Do not let this name put expectations in your head because Poe is an amazing and strong female captain that you will love from start to finish! I promise you will not regret this read. I listened to the audiobook and I really recommend. I actually listened to it and wouldn’t want to take me earbuds out. It reminded me of a Daughter of a Pirate King which I read last summer and now it is one of my favorite books of all time. I picked this up because NayaReadsandSmiles recommended it if you enjoyed that duology and I’m so glad she did! I think that everyone she pick this up whether you enjoy Condie’s works or not. *SPOILERS, do not read if you plan to read this book bc there are MAJOR SPOILERS. Let me just say, I loved reading from Poe’s perspective! Her thoughts were so interesting to read because she was such a strategic and mysterious character. She did not show her feelings very much on the outside, but she would be screaming on the inside. She cared for her crew and wanted the best for them. Poe came off strict, but her heart was still a 17 year old girl. I just can’t talk enough about her character. OH MY GOODNESS. MY HEART. MY TAM. Why did he have to die? I needed Poe and Tam to be together. I personally really loved this cook even though he ended up being a part of the raiders team. He and Poe just got along well and they were becoming close at the end. THEN NAOMI SHOT HIM. I was devastated listening to his tragic death. I needed him to live. Poe had him, then she lost another loved one. He balanced out Poe and he was such an innocent boy that did not deserve to die. NAOMI! SHE WAS THE TRAITOR. SHE SHOT HER OWN CREW. I JUST WANT TO GRAB POE’s RIFLE AND SHOOT HER MYSELF FOR KILLING TAM. I liked to see the memories that Poe would have of Cal. Her heart would hurt so she remembered how much she loved Cal. Poe would never forget her one true love that left her one night. She might never love again, but Cal’s sweet smile makes her reminisce the good times. My favorite scenes were probably when her and the special part of her crew were in the wilderness. Or when they were back in the ship. I don’t know, everything was my favorite. I did not like her having feelings for Brig. NO SHE BELONGS WITH TAM. I’m sorry, Tam was the one. I would like to start off by saying thank you to Penguin Teen and Dutton books for an ARC of this book in exchange for my honest review. 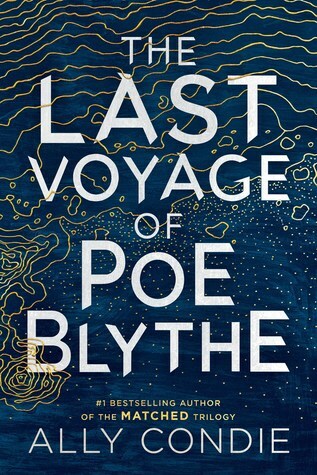 The Last Voyage of Poe Blythe is a great YA dystopian novel. Ally Condie has a very precise way of writing that gives the reader exactly what they need to know to understand the characters and the setting of the story without being bogged down with unnecessary fluff and filler. The adventure of Poe is very exciting and there are multiple parts of the story that I would like to start off by saying thank you to Penguin Teen and Dutton books for an ARC of this book in exchange for my honest review. The Last Voyage of Poe Blythe was a wonderfully addictive read with elements of revenge and redemption. The atmosphere of the story was beautifully set, with an industrialist feel that added a layer of oppression and untapped ambition. Condie wrote a great heroine in Poe with her realistic motives and a self-sacrificing quality not expected in a hardened character like her. From beginning to end I was on the journey with her and I didn’t want it to end. Though a character out for revenge can often feel very one-dimensional, Poe’s character was far from shallow. The catalyst for her story may have set things in motion, but it was far from the thing that kept her going. Her story never fell victim to tunnel vision or static growth, instead constantly evolving and growing as obstacles fell in her way. She wasn’t blind to the different endgames of her journey and I adored every piece of her as she pushed to keep going. Condie did an outstanding job at creating her, fleshing her out, and surrounding her with characters that could only enhance her growth. Through them she found herself and her future, and it was never with a concrete selfishness. Every beat of the constantly moving story—from the unknown, the twists, and the building tension—only pulled me in further, and I was in constant awe with how well done it was. My one point of issue with this novel—the only one!—was the complete lack of worldbuilding. Without knowing the worlds’ history or the setting of this story, I was unable to gleam the backstory that set this story in motion. I wondered throughout the entire novel what set the Outpost to being created, how they were separated from the world, and the idea behind all of those outside of it. If that element had been there, it would’ve added a much needed layer to an already great story by making it feel complete. Even with this missing, I can tell you that it was well worth the read. 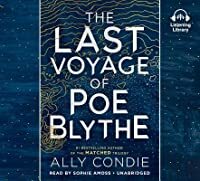 The Last Voyage of Poe Blythe is a must-read, action-packed story with a fantastic main character that will have you rooting for her from the beginning. The perfectly crafted seeds placed within the story—of what’s to come, possible future connections, and the direction of our main character—grew so subtly and beautifully that I cannot wait to experience what’s to come. I simply cannot wait for more. I had high hopes for The Last Voyage of Poe Blythe, but I was disappointed. It got off to a promising start, but fell flat in the end. Poe Blythe lives in the Outpost. A few years ago she and her boyfriend took their first gold mining voyage on a mining ship in the Serpentine River. Unfortunately, the raiders, who live outside the Outpost, boarded the ship and killed Poe’s boyfriend. Since then Poe has vowed revenge. Through cunning political maneuvering, Poe manages to be named captain of the ve I had high hopes for The Last Voyage of Poe Blythe, but I was disappointed. It got off to a promising start, but fell flat in the end. Poe Blythe lives in the Outpost. A few years ago she and her boyfriend took their first gold mining voyage on a mining ship in the Serpentine River. Unfortunately, the raiders, who live outside the Outpost, boarded the ship and killed Poe’s boyfriend. Since then Poe has vowed revenge. Through cunning political maneuvering, Poe manages to be named captain of the very last mining voyage for the Outpost. Now is her chance to get revenge. However, she finds that there is a traitor among her crew. My main complaint about this book is the vague world building. Poe lives in the Outpost, but we never really learn too much about life at the Outpost, why the Outpost exists, or its history. In my opinion, Poe’s story could have been told without the science fiction world the author created for her. The world is so under-developed as to make it superfluous. Perhaps the author had a point for that; if there was, however, it was lost on me. OK, now that I have the negatives out of the way, let me talk about the positives. The Last Voyage of Poe Blythe is a quick, entertaining read. At no point during my reading did I find myself bored or impatient. The pacing is very good and the characters are believable. 4.5 stars. Review to come! The Last Voyage of Poe Blythe is about grief. It's about the depths to which you fall in its maelstrom. But it's also about the quest for Poe to redefine herself. Is Poe a ghost? a murderer? A victim? What I adored about The Last Voyage of Poe Blythe was how multifaceted this book is. Whether it be how Poe struggles with her grief and loss, or how Poe must navigate the rhetoric and narrative of the Outpost, or even Poe's difficulty accepting people and relationships back into her life. Every aspect just builds to a crescendo throughout the book that will keep you from putting the book down. More than anything else, Poe wants to be free. Free of the Outpost where she lives and works / trains as a machinist. But she feels confined by the walls that surround the Outpost that the Admiral says are for safety. That no one survives outside the walls. So when there's an opportunity to be part of an expedition on one of the vessels sent out to hunt for gold, Poe and her boyfriend Call jump at the chance. Of course, they're plans extend past those of the Outpost. They're planning on jumping ship and trying to make it on their own in an unexplored world. That is, until the ship is boarded by raiders and Call is killed. Now, two years later, Poe is still grieving and wanting revenge for Call's death. She's outfitted the remaining mining vessel with outside armor that has caused more than one raider a brutal death in the intervening years, but this still hasn't brought Poe the solace she's seeking. When another mission is on the schedule, the Admiral wants Poe to be the captain. The why's and what for's are unknown to Poe but she's not especially in a position to say no. When she begins her tenure as captain it's not long before Poe knows there's a traitor in their midst. Someone is not happy she's leading this voyage and they're especially not happy about the gold being taken. With everyone a suspect, Poe will only be able to rely on herself. The Last Voyage of Poe Blythe starts out really strong. I think that grief over loss of a loved one is, sadly, a universal theme that many people can relate to, so it was easy to see where Poe's initial motivations were coming from. I felt like the world / setting was kind of half-formed, but I also felt like this was intentional. It's kind of an unnamed time and place which could be a stand in for any time / place. It's vague but purposefully so. I found that I didn't mind so much because it's clear from the beginning that Poe's journey is about her revenge. She wants the entirety of the raiders to pay. The idea of someone on the ship being a traitor presents a nice little intriguing mystery. I was completely prepared for a closed-room style mystery because there's only so many places one can go on a ship, especially one that's proved to be impenetrable time and again. But Ally Condie continually throws twists at Poe, as well as the readers, that challenge her perceptions. That make her begin to really question the Admiral's motivations. This is where I had the most issue with the story. The idea that Poe's allegiances are so up in the air. It makes it difficult to like the character or sympathize / empathize with a character if they themselves don't know what they're doing or what they're really fighting for. I was never sure if Poe was going to suddenly change her mind and abruptly switch allegiances again or if that was the plan the entire time, but it wasn't something vocalized to readers. I felt like I couldn't trust Poe's actions let alone anyone else's. I think I understand the motivation behind such ambiguity, the idea that as we grow and mature the world and how we view it changes. Poe holds onto the idea of revenge for Call to the point where she's blind to everything else going on around her. When she stops and actually takes notice her eyes are wide open. I understand this, but it still doesn't endear Poe to be. I kept waiting for the other shoe to drop. Which made things a little bit anti-climactic in the end. The Last Voyage of Poe Blythe is still full of excitement and mystery. It's quick-paced enough that I would sit down to read just a few chapters at night only to suddenly discover that I'd gotten through a good portion of the book. I think it's the type of book that's perfect for re-reading. Just like Poe, you might get something else out of the story when you look back on it with your eyes wide open. I loved every inch of this book. It was so much better than I had expected, especially with the revenge and the I-lost-someone-or-something trope. It was surprisingly really good. This book was very fast-paced. One hundred pages in and a lot is already happening. However, it’s not overwhelming. Everything flowed smoothly and well. It was adventurous and had a lot of action, which I loved. The thing I loved most in this book were the characters. I especially loved Brig, Indie, and Tam. They each s I loved every inch of this book. It was so much better than I had expected, especially with the revenge and the I-lost-someone-or-something trope. It was surprisingly really good. The thing I loved most in this book were the characters. I especially loved Brig, Indie, and Tam. They each stood out and had a purpose throughout the book for Poe. You’re not the only one who’s seen things you didn’t ask to see. Things you wish you could forget. And speaking of Poe, I loved her the most. She’s so fierce. Poe is made of strength and revenge. She’s clever and brutal but passionate. The book opens up with the event that lead to Poe’s grief. Seeing the boy she loved murdered. At first, I didn’t really think much about it because, well, it usually happens in books. Like, DUH. Unlike any other book I read where the character is driven by grief and finds something else to look forward to, Poe hangs onto her grief because that’s all she has ever known. Never once did she let her guard down to those around her. Poe has made that grief a part of her. I was mainly all about Poe throughout the whole book. The book was all about her. She was driven from within herself, but never once was she ever selfish. She questions who she could be because she wanted to make things okay and better for others. Am I ever going to heal? There’s so much surrounding Poe even when she tries to show nothing. She turns so many doubts into her mind, running it through and looking for a loophole. And I loved that unlike any other revenge-trope, Poe got herself moving through the grief by herself. She did not need anyone else to help her see or get through what she needed to do by herself which is to see what she lost and what she still had. She did not need anyone to help her see her grief and get through that grief. She did not need a new love or a new relationship. And sometimes, that’s reality. You only have yourself. Besides that, (the main reason I loved this book😭) other reasons I really enjoyed this book was because it took on SO MANY TURNS. I never knew what was going to happen. Whenever I thought I knew what was going to happen next, it totally switches up on me. The events are unpredictable. And it’s so amazing. Sometimes I am in the mood for a dystopia aimed at the young adult audience, but without a lot of world-building - just enough to set the scene. Common elements of this genre include teenage angst, romance, and evil political machinations by the adults. It’s what I would label easy escapist reading. This is what I had anticipated with this latest offering from Ally Condie, who wrote the “Matched” trilogy, even though this book is a stand-alone novel. Poe Blythe, 17, lost her true love Call two yea Sometimes I am in the mood for a dystopia aimed at the young adult audience, but without a lot of world-building - just enough to set the scene. Common elements of this genre include teenage angst, romance, and evil political machinations by the adults. It’s what I would label easy escapist reading. Poe Blythe, 17, lost her true love Call two years earlier when their gold-dredging ship was raided. Since that time, Poe devoted herself to avenging his death, using her skills as a mechanic to devise armor for her colony’s remaining dredger. The armor would tear to shreds any raider who tried to get onto the ship. The colonists are not aware of what the gold is used for, but they trust the Admiral with a sort of cultish belief in him and his assignments. With a crew selected by the Admiral, Poe captained the dredge and it managed to collect more gold than ever before. But it is clear there is a traitor on the ship loyal to the raiders, and before long, they are all in danger. Poe doesn’t know whom she can trust anymore - could the traitor be her one friend among the crew? Or the handsome First Mate who reminds her of Call? Or the sweet young boy who is the cook? And why would anyone be loyal to the raiders in any event? Poe learns, of course, as is usual in this genre, that the people she thought were good were evil. As for the supposed “bad guys,” nothing about them turns out to validate what she was taught to believe. And what about a new relationship? Would it be “disloyal” to Call? Most importantly, how, in the end, does she prefer to guide her life: by hate and revenge, or by love and rebuilding? Discussion: I was surprised to find this was a standalone rather than a trilogy. So much about the story is unexplained, especially the dystopian set-up, and about the object that turns out to be the motivation behind the Admiral’s behavior. At least in a trilogy, one would expect that answers would eventually be revealed. We also don’t learn much about the characters, not even Poe, except in an almost (inadvertently, I presume) humorous passage. The boy who seemingly falls for Poe because he thinks she is a good person explains that “You know what someone builds, you know them.” Um, Poe built a boat that is a killing machine. Just saying. 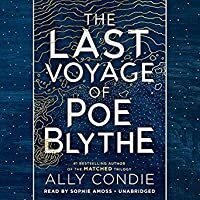 "The Last Voyage of Poe Blythe" is a fascinating YA fantasy/dystopian that is even better than Condie's Matched series. The book begins two years back when Poe is on a dredge voyage, working on a ship that mines the rivers for gold. She is madly in love with Call, the only person she has, and together, they count the stars and the time until they can escape. Both grew up in the orphanages of the Outpost, where work is hard and death is well-known. Raiders, people who live outside the Outpost, fr "The Last Voyage of Poe Blythe" is a fascinating YA fantasy/dystopian that is even better than Condie's Matched series. The book begins two years back when Poe is on a dredge voyage, working on a ship that mines the rivers for gold. She is madly in love with Call, the only person she has, and together, they count the stars and the time until they can escape. Both grew up in the orphanages of the Outpost, where work is hard and death is well-known. Raiders, people who live outside the Outpost, frequently attack the dredges to take the gold. Call is on watch when they attack and he is killed but Poe and the others are spared. I would have given this book two or three stars, at most, if the ending wasn't as amazing. If you've read her "Matched" series, you need to read this book. Seriously. It's a must. I'm not going to spoil anything in this review, but Condie is brilliant and the ending of this book was absolutely amazing. I finished "The Last Voyage of Poe Blythe" behind the library circulation desk where I work. I had to close the book, close my eyes, and try to slow my heart rate when the connection was made (you' I would have given this book two or three stars, at most, if the ending wasn't as amazing. If you've read her "Matched" series, you need to read this book. Seriously. It's a must. I'm not going to spoil anything in this review, but Condie is brilliant and the ending of this book was absolutely amazing. I finished "The Last Voyage of Poe Blythe" behind the library circulation desk where I work. I had to close the book, close my eyes, and try to slow my heart rate when the connection was made (you'll understand when you read it). My mind was blown to shreds. That being said, there were a lot of things I would change about this book. The first half of the book was incredibly boring. I was hooked by Call's loss and what it did to Poe. After that, Condie lost me. I would've stopped reading if I didn't love Condie so much. I wanted to continue reading for the sake of the author, not the story. Turns out, the story line was incredible... just super slow. It really picks up a little over half-way through the book. From that point, it has consistent action and develops the page-turning nature that we readers crave in a book. You just have to get past the first half of the book. As a writer, I know that the first bit is supposed to show you what the "day-in-the-life" looks like for the characters. Condie took that a little too far, in my opinion. However, I can definitely see Condie's maturity as a writer flourish compared to the "Matched" series. Great books, definitely recommend them, but "The Last Voyage of Poe Blythe" was better written. Plotting could've been designed better (as mentioned), but the writing itself was superb. Okay, so let's talk the first half of the book. The characterization was overemphasized. We understand the Brig is strong, Poe has severe trust issues, Naomi is stoic, and Tam is young and eager. We get all of that. The emphasis makes sense because you see the characters change, as we should, through the book... but, we didn't need that much guidance to come to those conclusions. We could see through character's actions; we didn't need to be told what the characters were like. All of that being said, I was going to give this a two-star review... until things sped up. It earned its third star for the middle-to-end-of-the-book plotting and the fourth star for the connectivity to the "Matched" series. Ally Condie returns with a new YA book. I am not sure if this a standalone or a new series. Poe Blythe has design a very deadly armor to protect the Outpost's river dredge ships. The ships are used to collect gold from the bottom of the rivers. They don't know exactly why the Admiral wants the gold, but all Poe cares about is getting revenge for her teen love, Call, who was killed by Raider 2 years ago on her last dredge voyage. The Admiral was Poe on this next Voyage which is the longest yet, and likely the last, and Poe says she will go as long as she get to be the captain. The rules of the dredge including never leaving the ship or going up on top so the armor could do it's job. This mean living in tight quarters with the crew, but everything seems to go well under a Raider attack lead to the dredge being under siege and Poe and a few selected member must leave the ship create some kind of a plan to take it back. I read this book pretty fast, only in three days, three work days at that, so the pace was pretty good. Not really slow. The issue I had were I didn't really connect with the characters. They didn't have enough backstory, but I guess since this is in first person, we only truly get Poe's POV. She not really a people-person. She withdrawn even since Call died, and she is very single-minded about her mission. She eventually starts to open up, but throughout the book she has trust issues since it appears that someone betrayed her and the crew. Also I had trouble picturing and understanding the Dredge. The only dredges I've seen were pretty small at the National Mississippi River Museum & Aquarium in Dubuque, Iowa. This is set in the same world as Matched was, but a very different society called the Outpost, which somewhere in the southwest, likely Nevada California or Arizona as gold plays a very important role. I actually believe the Outpost in Las Vegas and I noticed that there is a town in Southern California called "Blythe"near Mesa Verde, which the author probably used on purpose, so the river must be the Colorado River. So the trip starts in Las Vegas and probably ends somewhere in Blythe.